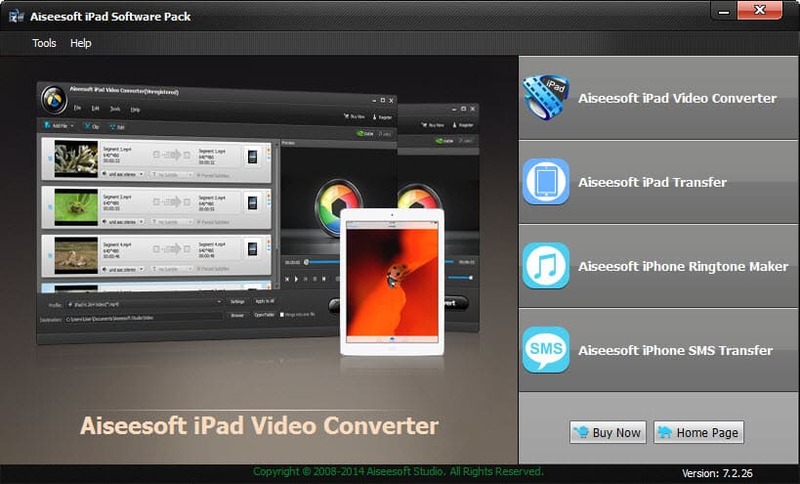 Aiseesoft iPad Software Pack is packed with iPad Video Converter, iPad Transfer, iPhone Ringtone Maker, and iPhone SMS Transfer. With it, you can convert popular video/audio files to iPad compatible formats, transfer video, audio and photo files between iPad and computer with nothing lost, make iPhone M4R Ringtone from your video and audio sources, even transfer/backup your iPhone SMS(MMS) and Contacts to computer/the program. Moreover, it highly supports iPad mini 2, iPad Air, iPhone 5s/5c, iPod Touch 5, iPod Nano 7, Microsoft Surface and Samsung Galaxy Note 3. The included iPad Transfer allows users to transfer iPad files like videos, audio and photos between iOS devices(iPod, iPad and iPhone). you can enjoy any video or audio file on your iPad, since this software is able to convert it to the format supported by iPad. With this iPad software, you can make your iPhone ringtone from any video and audio file. Clipping a video to your desired time length segments is permitted by this software. It can merge different video files into one and cut off unwanted playing areas of a video to fit your different portable players. And personalizing your videos with the image or text watermarks as well as adjusting its position, transparence, etc. also can be realized. This software offers you options in changing the parameters for output video/audio quality, such as Video Resolution, Video Bitrate, Frame Rate, Encoder and Audio Channels, Sample Rate, Encoder, Audio Bitrate. Also you can adjust the video brightness, contrast, saturation, hue, and volume. This software lists all audio tracks and subtitles of your source videos for you to choose.